Not for lack of trying, it’s been three weeks since I eyed a chukar (not counting the ones I finally cleaned the other day; oh, were they tender, but that’s another story). I’ve seen lots of Hungarian partridge (or gray partridge) in places I expected to see chukar. I’d say the Hun population in these parts is as good or better than last year’s. The chukar, though, seem to have vanished. I’ve found lots of old chukar sign in places I’ve found them for the past few years, but Angus hasn’t even gotten birdy in those crags. It’s as if they all went Jim Jones on us and offed themselves. Or they packed up and moved to Mallorca because they knew that the only fit people who visit Mallorca are professional cyclists and wannabees who don’t allow themselves to hike because they might damage their ever-crucial gastrocnemiuses. Disappointment doesn’t quite cover it. I’ve mentioned before that the spring and indicators promised a much better season than last year, but – so far – it’s much worse. Reports I’ve gotten from others concur: apparently nobody is finding chukar around here. 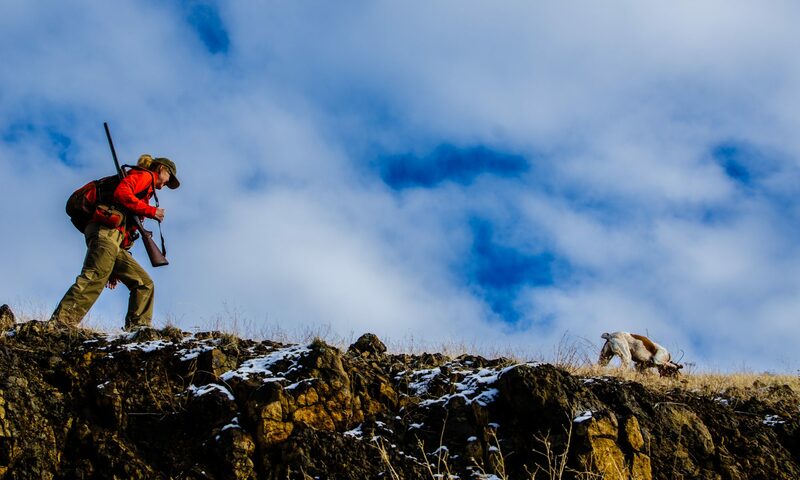 There’s an out-of-state group of intrepid chukar hunters who’ve hunted these hills since the 1980s (one of whom is a former Navy Seal), and they aren’t finding the birds despite doing 2,500 vertical feet a day. They’ve turned to ducks now. I’ll still go out looking. The Huns are there, anyway. But a new problem has arisen (it’s not really new, but my chukar frustration has refocused what I complain about): I never trained Angus to be steady to wing, and it seems he’s in the way of every covey bust so that I can only squeeze off one prayer of a shot without risking peppering him with lead. Yesterday Angus pointed four nice coveys of Huns. Despite trying to orient myself for a clear shot (below him, above him, to the side), each time the birds’ trajectory put Angus exactly between me and them. It’s my own damned fault. I never bothered to train him to do anything. “Our next dog…” we say. I hate feeling angry with Angus, especially because it is dead wrong. What’s that called? Woe is me. At least I’m getting out and seeing some birds. But recalling the mantra (“The worst day chukar hunting is better than the best day at work”) is getting old fast. It snowed here last night, and after a torrential storm it’s a bluebird Sunday. Angus and I are headed out. More later. Life is, despite the foregoing, really good. Sadly, I had low expectations for this years chukar population. I spent a week each floating Hells Canyon and the Main Salmon rivers this summer, and neither saw nor heard many birds. But as Buddha allegedly said, life is suffering, so out to the hills we go anyway. Did Buddha live in a part of India where there were chukars? All of my local haunts are bird less as well…an this is way down in southern Nevada, find feathers, dust holes, droppings, no birds. They aren’t even talking either. Swapped to lower elevation to try some gambles, an they seem to be the same way, but I find them late afternoon in areas that history tells me they shouldn’t be…maybe the Chukar are where they usually aren’t? Wish I could get out more to figure them out, but I’ve got a new baby on the ground, so my time in the hills are limited this year. Good luck to you hopefully with some snow on the ground you’ll put some birds in the bag. They always hunt better in the snow. I had Jake trained to stop at flush but let that slip. It really does affect my shooting ability. Not that it’s that good anyway. I was on the other side of the border last week and was happy to see things looking up some. Even though I saw birds, like Travis said, I only heard birds talking one time in five days on the hill. Oh yea, if you want to get Angus polished up a bit, you should give Dave Walker a call and get one of his training videos and a checkcord/collar. Since he already points, I bet it would take a week or so to get him STW. Previous PostPrevious It’s a good year for…snakes! !